Right now my goal is to restock those soaps I’ve sold out of. Generally, to be honest, making not-new stuff really isn’t that exciting, but I’ve had time to play, so that’s made it worthwhile. First, I soaped Ooh La La-vender, my goat’s milk and lavender soap. I have to be careful with some of my fragrances currently, so hubby’s been great about helping me out. 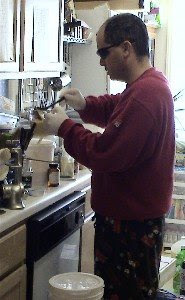 One rule I maintain is, everyone who is in any way involved with making soap must wear the appropriate safety gear, including gloves and safety goggles. Peter, however, thinks my safety goggles look dorky, so I let him improvise. Wouldn’t ya know it, lavender is one of those scents I have to be wary of, so he was helping me with Ooh La La-vender on this particular day. 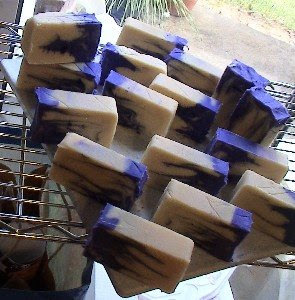 I made up the base soap and set up the color (ultramarine violet), then he came in, added the scent, mixed the color into part of the soap and poured it into the mould. This was his first time attempting a swirl of any kind, and I could only instruct from afar, so he was almost on his own. Friday night we sliced the loaf, and we were both thrilled at how beautifully our joint endeavor turned out. Aren’t these awesome??? 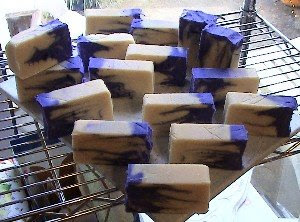 This is the third batch of this soap I’ve done, and the first time, my soap, the non-purple part, was orangish-brown from the goat’s milk having burned a little in the saponification process. The second batch was a bit better; the non-purple part was light tan. This, though… When I saw how creamy the goat’s milk part was, I was awed! I’m really excited to be offering these to you, and they’ll be ready for purchase at the end of January after they’ve finished curing. Of course, they smell FaNtAsTiC! There’s a lavender-scented aura around my curing rack that captures our noses every time we walk past it.